We are very particular as to which forever homes we choose to place our puppies. The following are a few testimonials from current owners of Wyndance puppies. We are fortunate to have them as extended family! "James has been a wonderful addition to our family. Thank you so much for picking us to have one of your beautiful puppies. He is 6 months old now and is leashed trained, can sit, lay, stay and generally minds very well. He loves going on walks, playing with Cameron and with Abby our other dog. He is so sweet and learned very quickly not to jump and waits very patiently for you to pet him sitting down. Where ever we go people are attracted to him and always comments what a beautiful dog he is. When he sees little toddlers he will automatically lay down so they can pet him and we never taught him this, he just loves people so much. He just loves when Cameron gets home from school and showers him with love, Cameron and James are best buds! You took such wonderful care and went through great lengths to ensure we were informed and knew "what we were getting into". This was our first puppy experience and you helped make it a positive experience for us. You took a lot of effort and time to match your puppies personalities with the right family. I am constantly amazed at people/friends I know that bring home puppies too young, not weaned properly, not socialized and have no idea what they are doing. I highly recommend anyone to buy a puppy from you!" "We want to thank you for deciding on our family for “Storm” to be a part of. We know it was difficult for you to decide to ship him, but he was a trooper through the whole ordeal and it was worth the wait for us. We had many emails and phone calls to get everything in order, but it was the best decision you could have made for Storm and us. We appreciate the fact of how much you care for your puppies in letting them go at the right time and to the right people and also the extensive knowledge you have dealing with different situations. We always are complimented on what a gorgeous dog Storm is, what kind of dog, his color for a Golden, where he came from…and of course, we highly recommend you. You take so much pride and such great care with your litters and dogs, and for real dog lovers, that is a blessing. Storm has just graduated from his beginner class and is enrolled in the next intermediate class. He is a very intelligent puppy and so lovable. He loves playing with our other English Golden “MacKenzie”, his cousin Cheney, neighbor Cidney and co-worker Tanner. He is surrounded with so much love, hugs, kisses, family and friends and we just can’t thank you enough for choosing our family to make his own. Purchasing a puppy from Wyndance Goldens was one of the best decisions we could have made. We can’t say enough about the whole process and appreciate you making everything so easy. We will stay in touch with you and send you pictures to keep you posted as Storm gets older so you can see what a great decision you have made." Thanks so much Cindi…for everything. 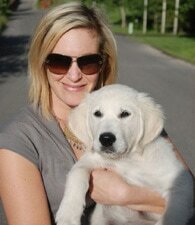 "I knew it would take a special pup to replace my beloved "firstborn," an English Yellow Lab named Cali. He or she would have to be strikingly beautiful (a "show-stopper" is what my grandma used to call her), exceptionally gentle and loving, but still have enough "quirks" to give him or her their own personality. The first time I met "Mr. Orange" (now known as Dutch) at Cindi’s, I knew Cali would approve. Dutch leaped into the craziness of our lives with tail wags and kisses. He survived his first car trip home to Austin without a whimper, then immediately joined the shuttle to and from the kids’ school every morning where he was lavished with attention from the kids ages 3-12. One week later he took the annual trip to South Padre Island where he braved the surf and discovered his love of digging in the sand. The rest of summer has been a flurry of car rides taking the kids to and from camps, spending time on the boat at the lake, swimming pools, and walks and dining at the outdoor shopping mall. As you can see, having Dutch has not slowed down our family at all – but he has added joy to our lives and made us proud to call him our "ours!" "DO NOT GET THIS DOG!!!! If you don’t like people, and/or don’t like being delayed, then this is NOT the dog for you! When accompanied by this dog you will be stopped by strangers in all places at all times with questions and comments like, “what kind of dog is that?” Can I pet the dog?” and “THAT is the most BEAUTIFUL dog I’ve ever seen!” People with scary body piercings and wild colored hair will SMILE at you and say, “Cool dog, dude!” You have been warned..."
"My husband and I bought a puppy from the Williams' and have been absolutely THRILLED and thouroughly impressed from the beginning to the end. I cannot say that there is actually going to be an "end" because we are still delighted to keep in touch. 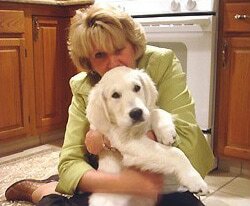 I have purchased puppies before in my time and I have never expereineced the love that was put into my puppy from Cindi with Wyndance Goldens. She doesn't take a litter lightly but puts all that she has into each one of them. I cannot say enough about our experience but I can say that it had to be and continues to be THE BEST and hard to come by. She TRULY LOVES her own pups and puts the utmost care into her litters. 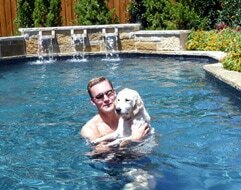 We have been blessed with an incredible European Golden, who already is ready to please and is so affectionate and loving. She was just introduced to little children the other day in our family and they could practically lay on top of her and she just loved on them. Sooooooooooooo cute! What can I say, other than we are 100% satisfied with the entire process of buying a puppy from Wyndance Goldens.....................totally professional but filled with a TON of love!! Thank you, Cindi!!!!" 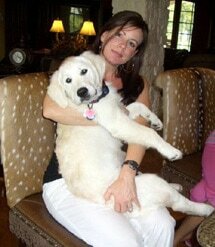 "Dear Cindi, Thank you so much for letting Larry join our family! We are so happy to say that even though he is only four months old, he already appears to have all of Harry’s good looks and lovable personality. He is also extremely intelligent and has excelled at his training; he especially enjoys swimming and hunting training. In addition to taking pleasure in being around kids, Larry is also great with other dogs, interacting equally well with both large and small breeds. He is such an amazing dog; we are looking forward to many, many years of companionship with him. He was definitely worth the wait!" "Hi, Cindi. Well, what can we say about Barney? He's just the greatest puppy and has so quickly become one of the family. He's smart, he's got a great personality, and when you approach him he likes to lay on his back, wagging his tail, waiting for some petting and belly rubbing. He just finished his first puppy class, and has mastered 'sit' and 'down', and is really doing well on 'leave it'. He's also learning to 'heel' and 'go play' when he walks with Jack and Maggie. He graduated to a big kennel during the day, and he's sleeping with us on the bed at night. We're SO glad it worked out for us to get him. We look forward to a lot more fun ahead, and staying connected."